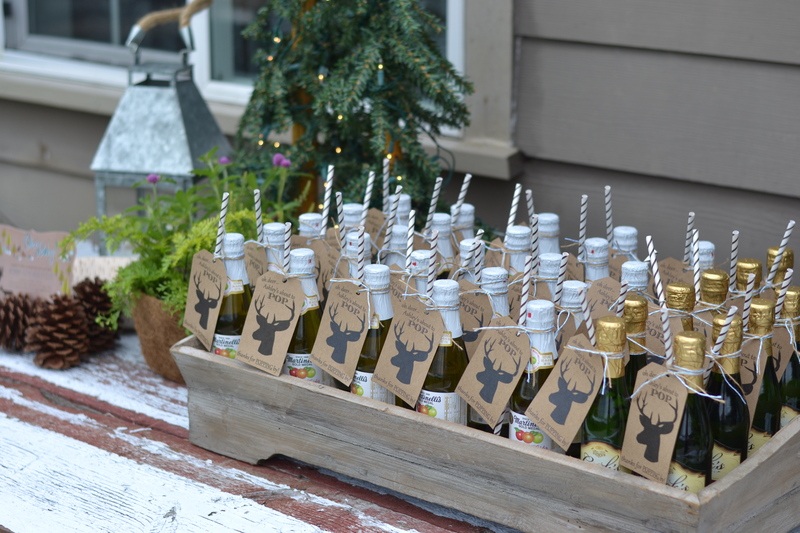 This past summer we had a few backyard parties and one of my favorite celebrations was for my dear girlfriend and her baby BOY #4…We showered baby Duke with a Woodsy Whimsical party, featuring lots of sweet lil’ bucks, antlers, pine cones and woodsy elements. 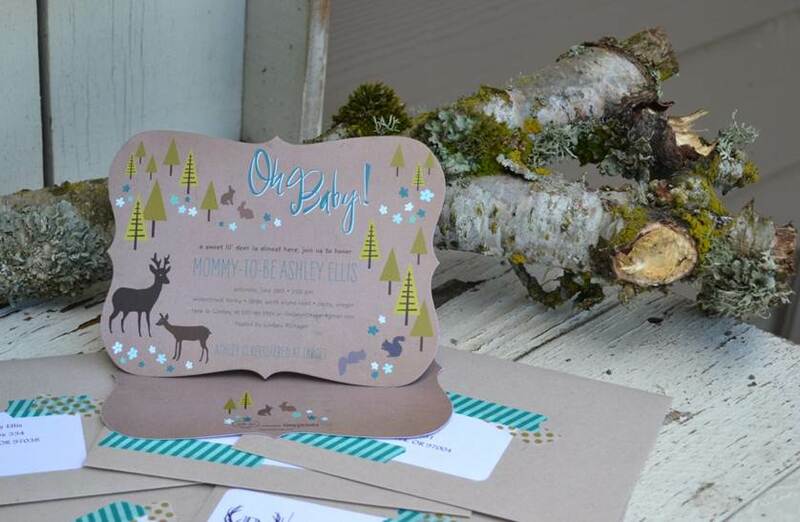 I found these adorbs Kraft Brown invites from Tiny Prints, under the theme “Forest Dwellers”. 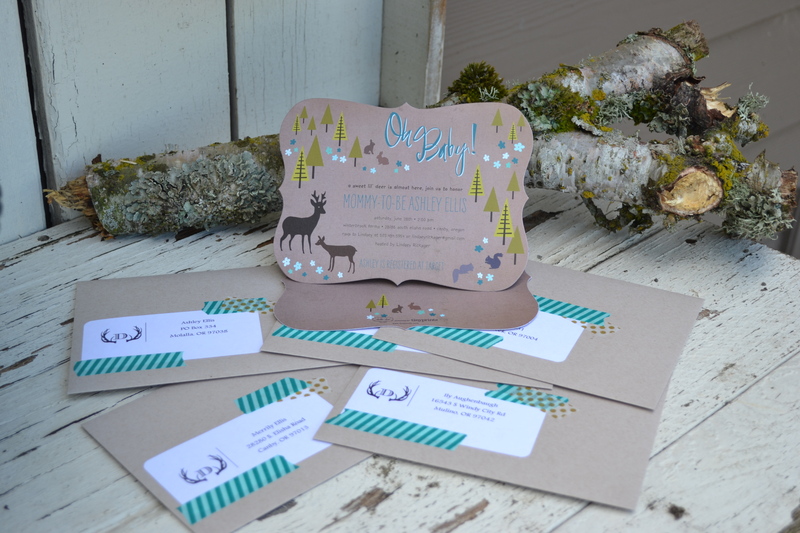 Tiny Prints is my go-to site for cards and invites. 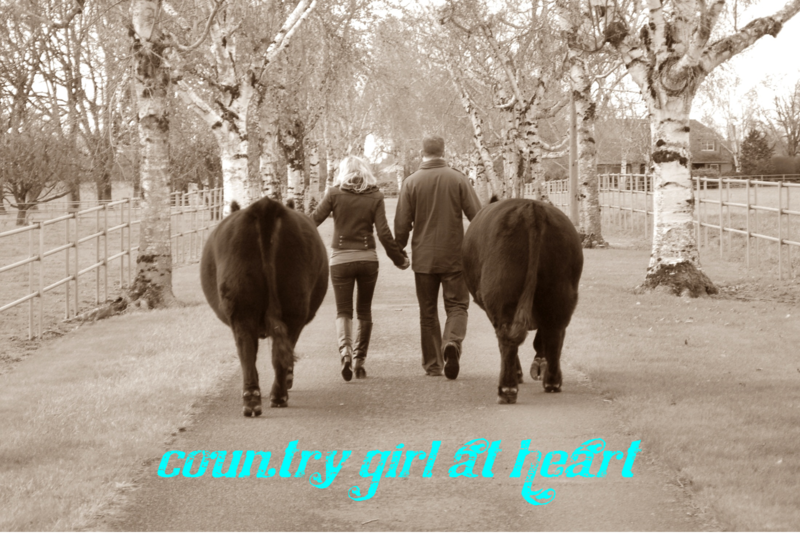 They have the cutest designs and are so easy to customize through their step by step site. Plus they always have a great coupon or promo codes. 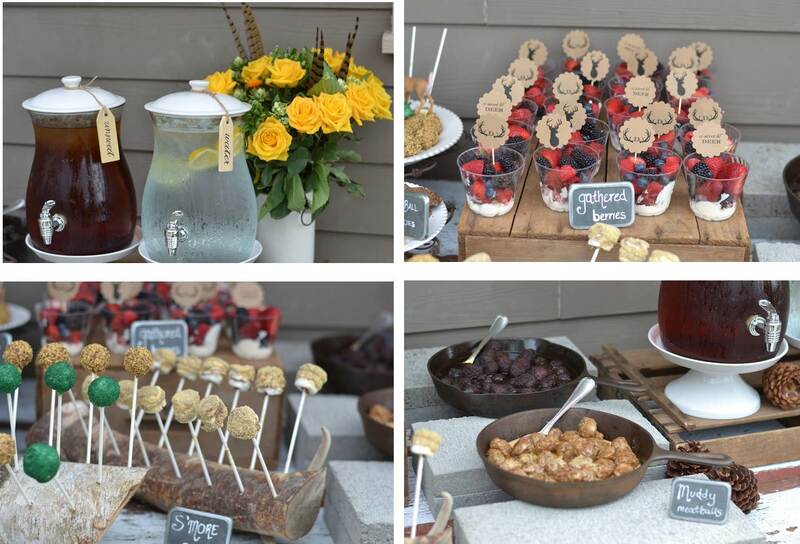 I designed and created a few simple craft projects for above the food/dessert table. 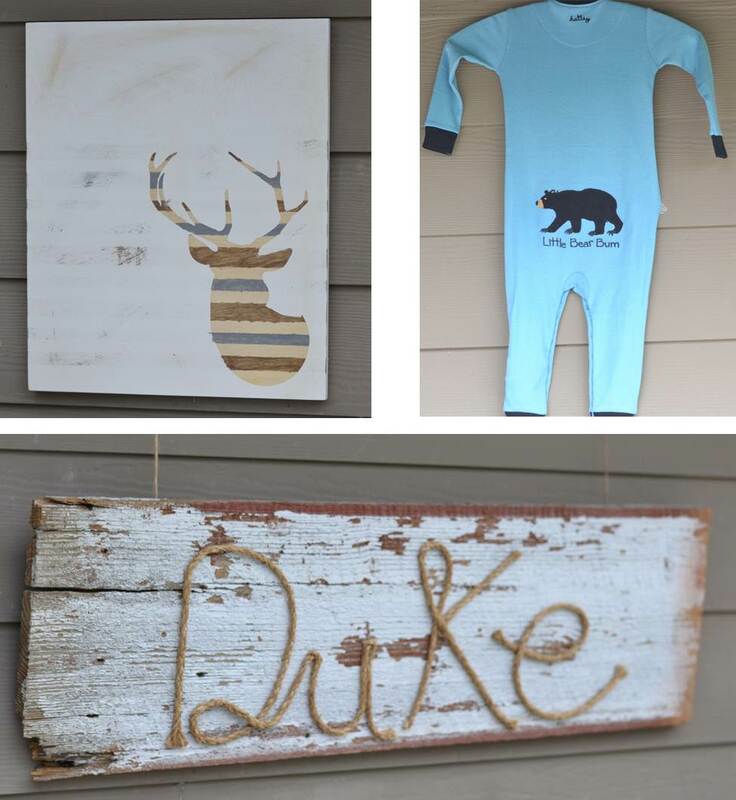 My goal was to create a few cutesy items that the momma-to-be could use in the nursery/home for decor. 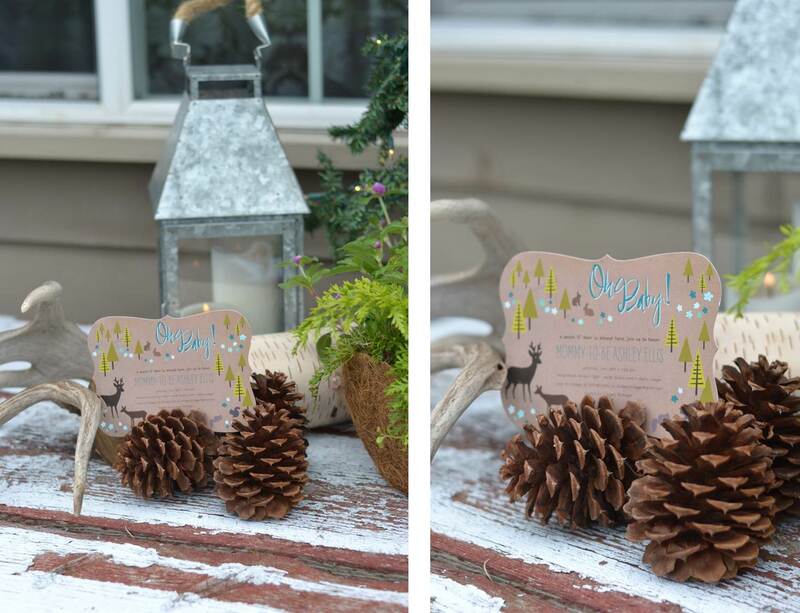 The wooden name sign is a super quick and easy project that would be perfect for an woodland, cowboy, rustic or nautical themed baby shower. 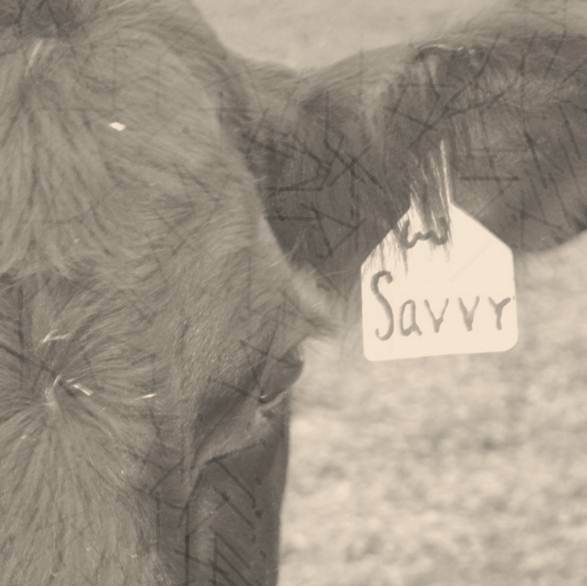 I pulled a piece of barn wood from our scrap pile and cut it down to my desired size. Next sketch the name of your choice in pencil and begin using your hot glue gun to glue down the jute rope. You may need a few finishing nails to hold the rope, while the glue dries. 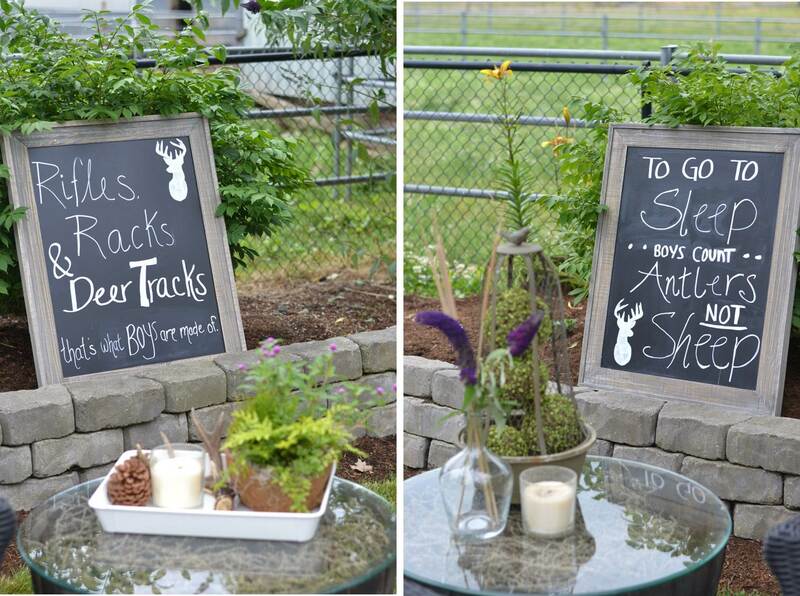 I love these over-sized chalk boards for outdoor parties, they come in handy for charming sayings, menu boards or welcome signs. 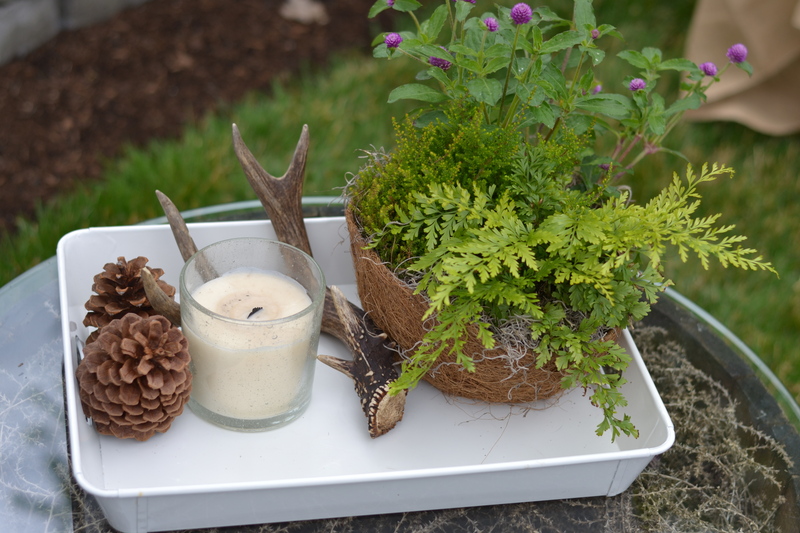 One of my summer obsessions was MOSS letters… all you need a is a wood letter from the craft store, a little sheet moss, and some hot glue. VIOLA! 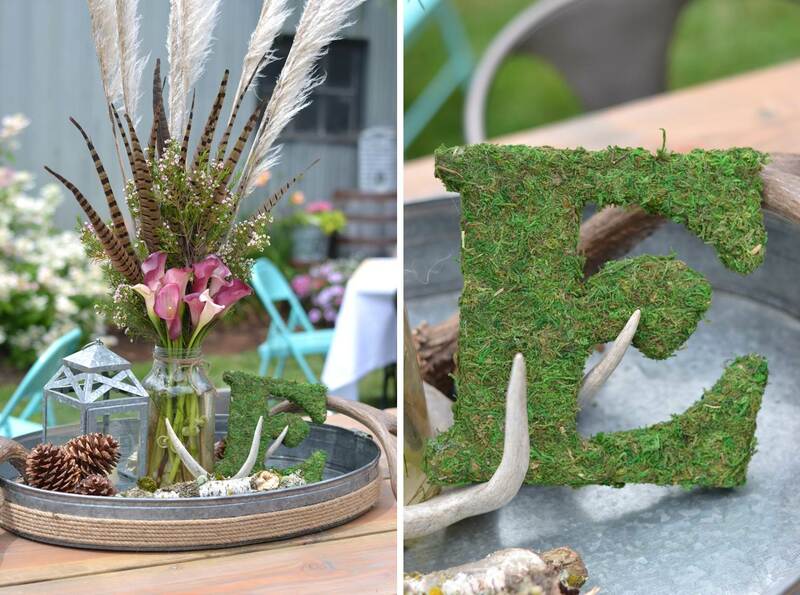 You have a sweet moss letter for a wreath or party decor, such as a baby shower, bridal shower or wedding. 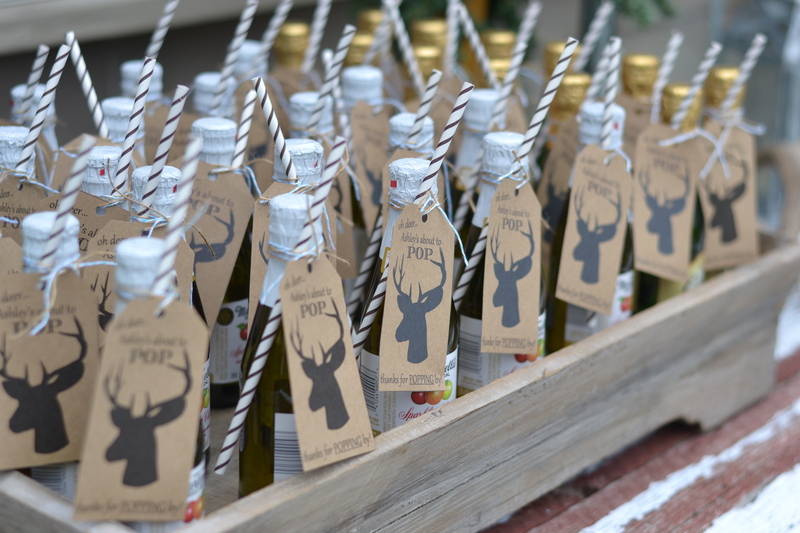 For the shower favors, I purchased splits or mini champagne and apple cider bottles from Costco and attached a paper straw with a cutesy Kraft paper tag, which reads “Oh deer…(enter momma-to-be name) is about to pop” or thanks for popping by”. 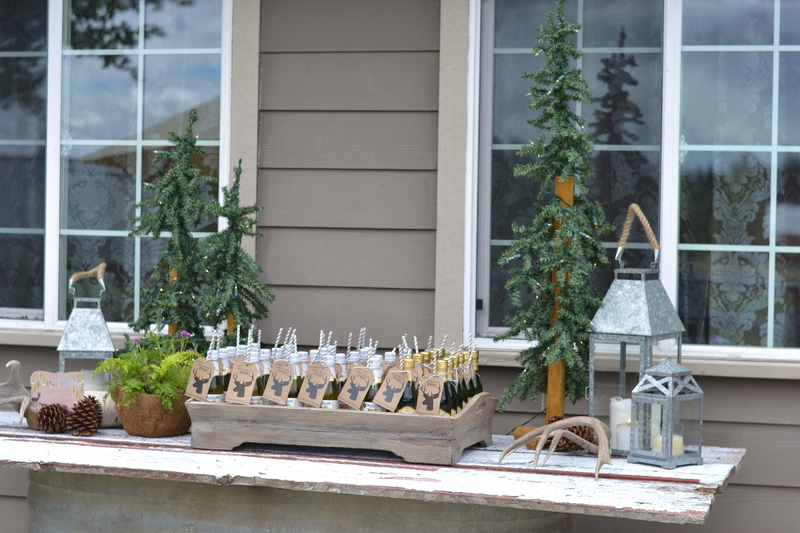 Bring on the food and sweet treats… Our 1/4 mile farm driveway is lined with stunning birch trees and every winter several limbs fall off the trees during our wind storms. But the not so stunning part to my daddy and hubby is when I beg and plea with them to cut up the limbs in to nice clean edged logs, solely for decor purpose. Therefore, I raided my gorgeous birch log stash and drilled several holes into a few limbs for cake and s’more pop holders. 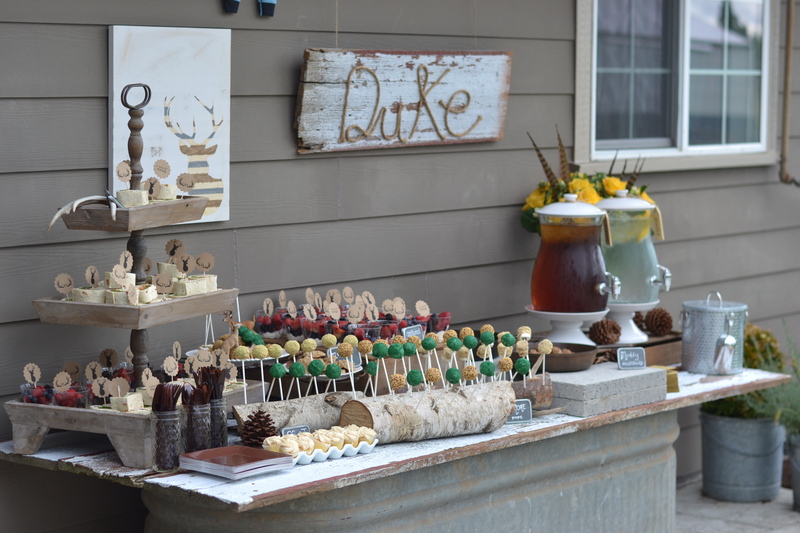 I hope you enjoyed my version of a Woodsy Whimsical Baby Shower and the most whimsical part was welcoming baby Duke into this world. 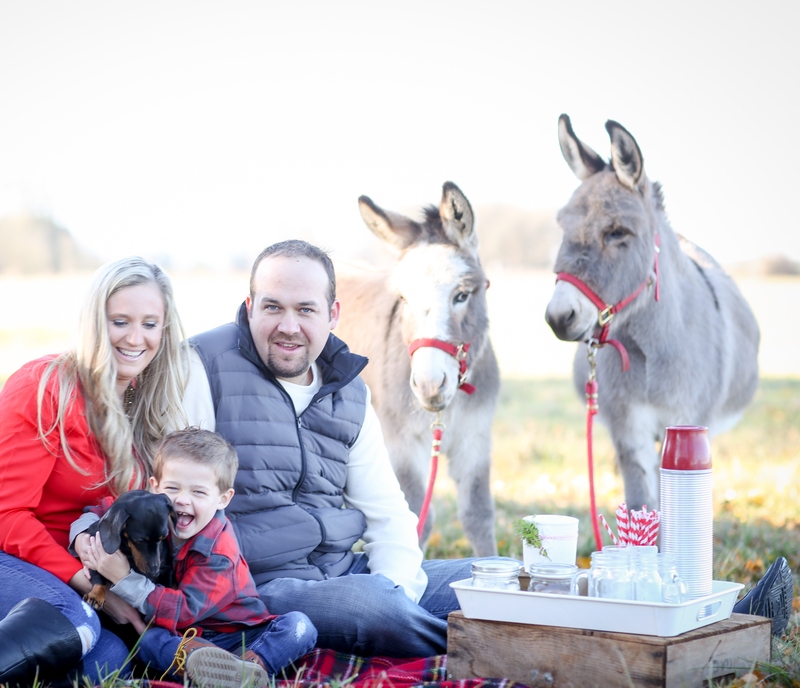 Congratulations Ellis family on your new addition, making now four sweet and handsome boys.